The 5 Myths About The Sky Mural Restoration at Grand Central Terminal | John Canning & Co.
On February 2, 1913, after 10 years, $80 million, 3 shifts per day, and up to 10,000 workers at a time, Grand Central Terminal opened to the public. In the late 1990s, after years of neglect, near demolition, and a miraculous designation as the first historic landmark under the US landmarks conservancy act, a comprehensive restoration of the station’s structural, architectural, and decorative details returned the historic landmark to it’s former glory. Plans were also adopted to expand the purpose of the station to include a diverse selection of restaurants and shops that would serve commuters and tourists alike. 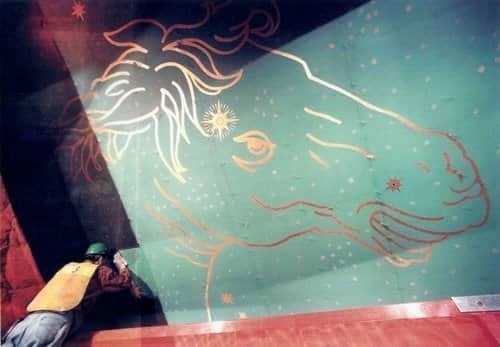 In the fifteen years between the completion of the restoration in 1998 and the 100th anniversary celebration in 2013, myths and legends surrounding the creation, condition, and cleaning of the sky mural began to circulate, ultimately taking hold as fact in stories from such trusted sources as NBC News, NPR, and documentaries and articles produced by the History Channel. Even scripts provided to station tour guides today, as well as the current audio tour app, perpetuate these myths. The John Canning Company was hired to conserve and restore the sky mural. We joined a team of architects, conservators, engineers, and preservationists to study, analyze, test, and define the condition of the ceiling mural, the composition of the dirt covering it, the formula for the cleaning solution, the exact materials to be used, and process to be followed by our team to clean it. While the constellations depicted in the mural are mythical, the restoration of them shouldn’t be. The point of view for the constellations is not from earth looking up, but rather from beyond the constellations looking down toward earth through them. Designed by artist Paul Helleu, the composition was developed by J. Monroe Hewlett and executed by Charles Basing and his team. As many as 50 painters executed the mural directly onto the curved, plaster ceiling. While we may think it more logical for the composition to have an earth-to-heavens point of view, there is simply no evidence of the mural’s orientation being a mistake - or intentional for that matter - either on the part of Mr. Helleu or of those who painted it. The original mural was damaged beyond repair from roof leaks that destroyed the plaster. In 1944 it was decided that the mural was to be duplicated on fiberboard panels cemented to the plaster ceiling. Charles Gulbrandsen and his team were the artists responsible for the replication. During the cleaning process, our artists uncovered notes, messages, and signatures of the workers who recreated the mural. Weddings, births, soldiers returning from war, and most notably, the end of World War II are all chronicled among the constellations and remain untouched. One of our favorites is the birth of twins noted near the Gemini constellation. Myth 2. The dirt on the ceiling and walls was a build-up of tar and nicotine from cigar and cigarette smoke. A detailed analysis of the dirt by scientists at McCrone Associates reported that the dirt and grime did not contain any nicotine or particles that could be attributed to cigar or cigarette smoke. The cause of the sometimes 2-inch thick grime was the decades of air pollutants - specifically car and truck exhaust, and the emissions soot and contaminants from industrial plants and apartment-building incinerators. These pollutants, multiplied by New York’s 14.8 million residents in the 50s, made for alarming cover stories in LIFE magazine featuring NY smog. The breath-defying air in NYC and other big cities at that time led to country-wide clean air regulations beginning in 1957, the first federal Clean Air Act in 1963, and most important, mandated emission standards for automobiles, trucks, and busses beginning in 1970. For all those years, Grand Central stood in the midst of that haze with it’s windows open to the pollutant-laden air. But the smoke from hundreds of thousands of people passing through the terminal each day did not contribute to the heavy layer of dirt and grime found on the ceiling surface 125’ above. During the ceiling restoration, it was business as usual below. The trains kept running and 500,000 people passed through the station each day (today the average is 750,000 daily). Scaffolding throughout the main concourse would have been cost-prohibitive, impractical and hazardous. Instead, a 30-feet wide, trussed platform, curved to match the barrel-vaulted ceiling, was built to span the 120’ wide concourse with a work surface that provided easy access to the mural. It was mounted on rails at each wall - the same kind of rails used on the tracks, supported by a single course of scaffolding on both sides of the concourse. The Canning team worked alongside other contractors, carefully coordinating the completion of their tasks and the movement of the platform to each new section. Myth 4. A common household cleaner, or soap and water, applied with cheesecloth was used to clean the mural. It’s true that a commercially available cleaner was specified for the cleaning of the ceiling. However, once it could be accessed, tests on the ceiling showed the cleaner to be too aggressive, harming the paint and decoration in addition to removing the dirt. Our professional conservators developed a series of tests using peer reviewed fine-art conservation solutions commonly used to clean artwork found in public spaces. The final solution was a combination of systems that were used successfully on the Boston Public Library staircase murals, and the priceless Sistine Ceiling paintings. The cleaning solution was specifically formulated to address the exact composition of the dirt to be removed, and the composition of the paint and gold-leaf surface beneath it. The final solution was ph neutral. It removed the dirt completely, and was harmless to the decorated surface. In fact, it left no residue so rinsing was unnecessary. Cleaning was carried out in small sections of two to three square feet by our conservator and trained technicians with the experience to know what they were looking at so they would recognize a problem before causing any damage. They applied the cleaning solution with white cotton terrycloth towels. The towels were professionally laundered until they produced a neutral ph when saturated with cleaning solution. Depending on the area, a soft, natural sea sponge, a cotton batting pad, or a soft brush would have been used to work the cleaning solution into interstices of the panel. At no time was a soiled towel, sponge, pad, or brush dipped into the cleaning solution. The solution-soaked cloth was wiped over the surface to loosen and pick up dirt. As the cloth became dirty, it was folded to expose a clean side. Soiled cloths were discarded and the process repeated until the cloth was no longer soiled. The cleaned section was dried thoroughly before moving on to a new section. At the start, concerns were raised about accidentally spilling liquid onto the crowds 110 feet below. After much discussion of complicated, engineered fixes, the safeguard turned out to be simple and inexpensive. The buckets were placed inside plastic “kiddie pools”, as a first line of containment, in which a spill could be completely contained. We used approximately 6,500, 18” x 18” white cotton terry cloths (800 pounds) and hand carried 1,500 gallons of water to the 37,000 square foot ceiling. The ceiling is covered with over 900 8’ x 4’ fiberboard tiles that hold the gold-leafed images of eight constellations, from Aquarius to Cancer, 2,500 stars, 60 illuminated starts, thousands of gold dabs representing other stars in the Milky Way, and intersecting bands representing the ecliptic and the Equator. Our team of 3-6 people – 2 fine arts conservator plus trained technicians - worked 7 hours per day, 5 days per week over 6 months to complete the mural restoration in April 1997. Work was sometimes delayed because all of the contractors and trades working on the ceiling had to complete their work before the platform could be moved to a new position. The platform moved seven times to span the ceiling. 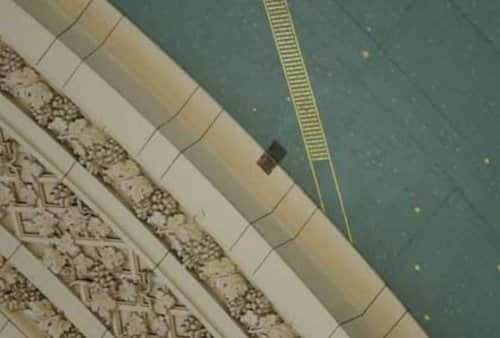 The customized cleaning solution was so successful in releasing the dirt from the surface without damage that very little in-painting or gold-leaf repair was needed. We used less than 1 quart of paint, and approximately 30 sheets of 4x4-inch gold-leaf squares to complete the restoration. The untouched patches do provide a before and after illustration for viewers, but that is not their primary purpose. In conservation, it is standard practice to preserve evidence of conditions for historic documentation and to provide the opportunity for future study. Those patches provide the complete environmental history of the building’s interior from 1944, when the mural was recreated, to 1998, when the restoration of the interior was completed. If the controversy continues regarding the existence of nicotine and tar from cigarette smoke being the culprit for the discoloration and soil, those squares exist to provide the answers now and in the future. In our forty-year history, we have had the privilege of working on the most iconic US landmark buildings. The Sky Mural restoration at Grand Central Terminal is perhaps the quintessential example of conservation in its purest form. By fine-tuning conservation-quality cleaning agents we were able to methodically clean the mural and remove the decades of dirt without harming the mural. Eighteen years later, the Sky Mural brightly crowns Grand Central Terminal’s concourse – a Beaux-Arts cathedral for commuters; the biggest and busiest terminal in the world; one of New York City’s most important landmarks; and the 6th most visited tourist attraction in the world with more than 21.5 million visitors annually.